It's March already. The most rural of roads are dry and snow-free, even if still lined with shrinking piles of melting snow discarded and abandoned by the snowplow. Hockey fans and ice skaters wish their home ice could outlast those tallest of artificial drifts. But April will matter for sure. The pendulum swinging from frost-bitten to sun-burned is gaining momentum in your own back yard, and you may be racking your brains for ways to stretch the hours or days until the last hexagonal crystal melts. 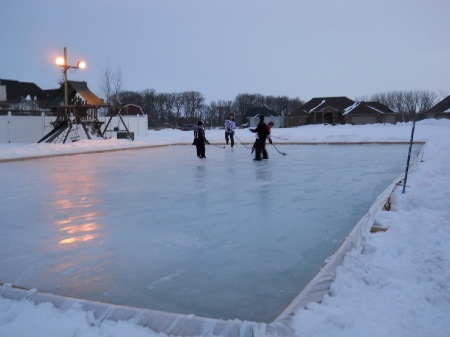 You've had a wonderful winter, and we know the wheels are turning for next year - how to create an even better backyard ice rink next season. And there's no time to waste - November is just around the corner! But is there any chance, right now, that you could stretch your home ice time just a little longer? Anything to keep skating? Well, not really. But yes! True, you can't stop the weather. February always turns into March, which turns into April in an amazingly short time. April is an icicle's biggest nightmare. But you can cheat the weather. You can even scam it! But first, here are a few ways to honestly preserve your carefully crafted ice for a few more days. If you built a rink with tall rink boards all the way around your rink, those boards will tend to trap the cold air right next to the ice. This will help to delay the development of slushy ice somewhat. You could throw an insulated ice blanket over the ice during the day. This will reflect the sun's rays and prolong the ice for a few more days or weeks. Be sure to always remove all snow from the ice just as soon as you can after the snowfall. An ice blanket protects, but the snow warms the ice...not good in March! If the nighttime lows are still dipping far enough below freezing, you could keep laying down more ice layers during the still-frozen night. This, combined with the ice blanket, may give you a bit more ice time. Make a note to yourself..."Self: buy 2'x10' boards next season, instead of these 2'x4's!" Cheat Mother Nature: You yourself may have cheatster friends, the ones with refrigerated ice rinks! Yeah, you know it too - they're your "best buddies" between March and May. Their refrigerated ice rinks are giving them up to 3 months of extra backyard ice time. The Big Ice Scam: Perhaps you've seen them - glorious expanses of pristine white in July. It's 90 degrees outside (32 C) and there's no ice in sight. That sea of white is...is...it's not a mirage, it's PLASTIC! Yep, high- or ultra-high density polyethylene - synthetic ice. If that isn't a SCAM, we don't know what is! With a synthetic ice rink, we can "fool nature" (or maybe even ourselves!) and enjoy 365 days a year of skating and hockey practice that is nearly as effective as ice, maybe more so. And minus the parkas or even shirts. For a price, you can indeed prolong the skating season every year. Is the expense of synthetic ice or refrigeration spendy, or essential? That will have to be your call. 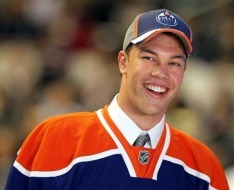 Edmonton Oilers Rookie Taylor Hall is proving his mettle - he's just pegged his first Gordy Howe Hat Trick. Nice! And in just 2 periods. He spent the third period nursing a left ankle, did not return to the Oilers - Columbus Blue Jackets game on March 3, 2011, and was seen leaving the stadium in a walking boot. We sincerely hope the injury was minor. 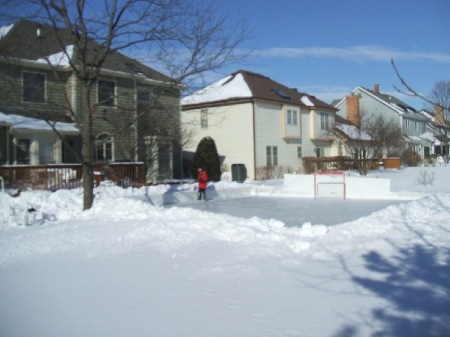 Home Ice, by Jack Falla, is most probably one of the best books ever written on backyard ice rinks. 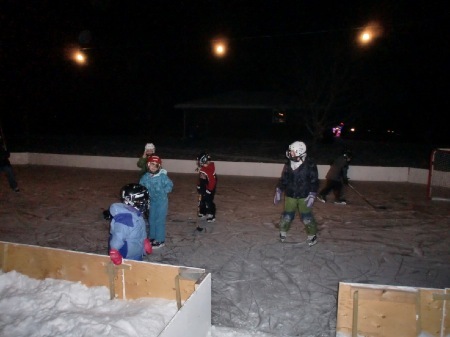 Mr. Falla warmly illustrates the ways that backyard ice rinks bring together families and friends, even strangers. Plus, he walks you through his own rink-building, which will quite possibly ignite the passion inside your own soul to build one of your own. It's March today, but October is coming. Start your springtime by reading the highly recommended Home Ice today. Bone up on the ins and outs of building a backyard ice rink, and when October or November rolls around (it'll be much sooner than expected! ), you'll be armed with information and ready to create your own home ice. Over 100 members have joined the mybackyardicerink.com Community thus far! We're fast becoming virtual friends as we share our successes while getting help for 'unsolvable' questions. Come join the mybackyardicerink.com Community! Share mybackyardicerink.com Ezine with your friends!